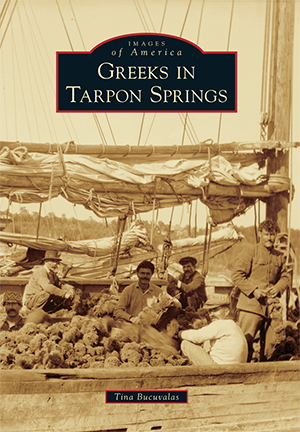 Beginning in 1905, large numbers of Greeks from the Dodecanese and Saronic Gulf islands settled in Tarpon Springs to work in the sponge business. They significantly expanded the industry and changed Tarpon Springs forever. Greektown flourished with residences, stores, churches, restaurants, and recreational facilities stretching from the sponge docks to downtown. Sponge fishing and related activities served as the economic base for the community. By 1913, as many as half of Tarpon Springs residents were reputedly Greek, and many businesses displayed both Greek and American flags. Today, Tarpon Springs' Greek community preserves a strong ethnic and maritime heritage. While some major US cities have a larger Greek population, no other has a greater percentage with Greek heritage than Tarpon Springs. As curator of arts and historical resources for the City of Tarpon Springs, Tina Bucuvalas conducts ethnographic research, creates public programs, and successfully nominated Greektown to the National Register of Historic Places. Previously, she served as director/state folklorist for the Florida Folklife Program. Bucuvalas gathered images from individuals as well as public collections including the State Archives of Florida, Special Collections/University of South Florida Library, Tampa-Hillsborough County Public Library System, Tampa Tribune, Heritage Village Archives, and the Tarpon Springs Area Historical Society.